Our muscles play an important role in the movement of our body. Without our muscles, we wouldn’t be able to bend our elbow or straighten our leg. As our muscles are soft and designed for flexibility, they are also prone to injury. In the period following a muscle tear, there are a few common mistakes people make. These can actually make their injury worse and delay healing times. Here are a few of the most common mistakes we see. After a muscle tear, the damaged fibres slowly begin to heal and reattach to each other. This process can be quite fragile and during the early stages, aggressive stretching of recovering tissue can impair healing or even lead to more tearing. While gentle stretching a few days after the injury can have a positive effect, you should check with your physiotherapist to ensure you’re not stretching too far and causing further damage. Most of us are aware of the acronym R.I.C.E (rest, apply ice, compress the area and elevate) as the recommended treatment in the early stages of an acute injury. The acronym H.A.R.M is less well known and is used to remember the things you shouldn’t do after an injury. This stands for applying heat, drinking alcohol, running or massage. All of these activities can increase swelling, pain and increase the damage of the injury in the first 48-72 hours. The diagnosis of a muscle tear might seem straightforward, however, there might be more going on than you realize. Many conditions can mimic a muscle tear, or you may have suffered a tear due to an underlying weakness or pathology. Having a physiotherapist confirm your muscle tear or identify another condition is vital to ensuring you recover fully. Your physiotherapist is also able to identify any factors that could lead to further injury and is able to help restore your tissue to its previous level. 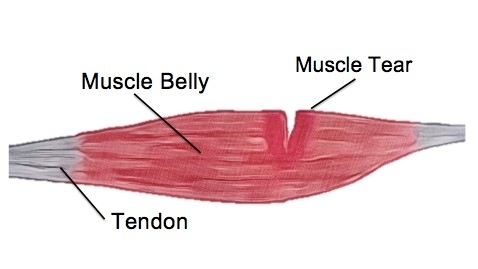 One of the most confusing things about muscle tears is that often they become less painful while the tissues are still not completely healed. Many people suffer another tear simply because they return to sport too early. While you may feel as though your tissues are back to full strength, the muscle fibres can still be healing and vulnerable to a tear. It is important to test your injury gradually, starting with gentle exercise and building up to high-intensity activities. Your physiotherapist is able to guide you with a full rehabilitation programme. This can help to restore strength, flexibility and control to your damaged muscle, keeping you injury free for the future.